On this day in 1980, Ian Curtis of the brilliant post-punk band Joy Division, hung himself in his home at the age of 23. It was on the eve of what would have been their first North American tour. I don't think I need to go into all the details of his life, as I'm sure many bloggers have and will when this day comes along every year. Suffice to say, he suffered from depression, physical and mental illness, which I'm sure with the stresses of his band demands, caused him a lot of duress. What I will talk about though, at 1am on this May 18th, is how I feel about Joy Division and what Ian Curtis's music meant to me. I can remember being about 14, and not being particularly happy. I'm sure a lot of you can relate to just "not fitting" at some time, possibly still. I don't think this feeling always goes away for a lot of us, I think maybe we just get comfortable with it. So I'm 14, unhappy, I don't fit. And I stumble across "Love Will Tear Up Apart". I don't remember how, but what I do remember is the melancholy voice, the wistful lyrics and the strangely cheerful melody. I didn't know what I was feeling at the time, but when I think about it now, I think it's akin to recognition, or to be cliche, the feeling of coming home. When you're 14 you don't consider that other people might be able to relate to what you're feeling. It escapes me sometimes still. 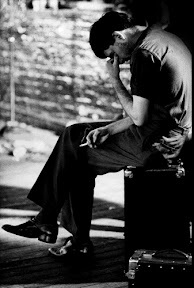 But here was Ian Curtis singing all these lonely things, and all these sad things, and I knew what he was saying. Some of the things, heartbreak for example, I didn't understand until I was older, but there he was when it happened, singing exactly what I was feeling in these moments when I feel so lost and hopeless. Things like this and music like this are precious, they can save people in one way or another. 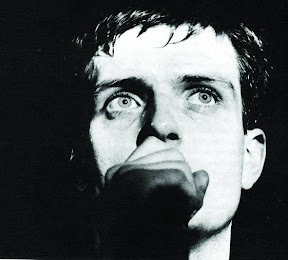 Ian Curtis has kept me company during many lonely times, and has kept vigil in the dark with me when I've been afraid. My heart is broken and I hear myself in "Atmosphere". I question myself and where I'm going and it's "She's Lost Control". I'm waiting and it's "Shadowplay". Blissful abandon and I'm "Transmission". In turn I always take him out to play on this day, no matter how long ago (maybe just a minute ago? ), it's been since I've listened to him, and I take a peek at the Joy Division posters lovingly rolled into their tubes from my teenage years, too cherished to ever throw out. And now I'm older, I'm still unhappy sometimes, I still don't fit, but I'm sitting here with a cup of tea and listening to "Unknown Pleasures", and it's quite okay because I'm definitely not alone. If you are not familiar with Joy Division, I highly suggest the album "Unknown Pleasures" and the film detailing Ian Curtis's life "Control". Do you still feel out-of-place?